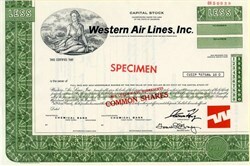 Beautifully engraved Rare Specimen certificate from Western Air Lines, Inc printed in 1974. 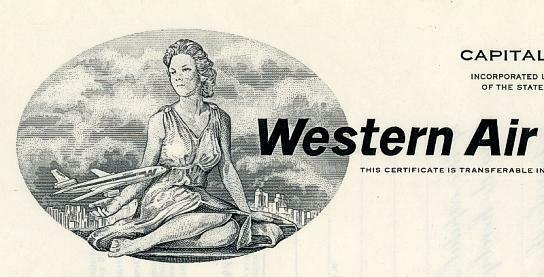 This historic document was printed by the Federated Banknote Company and has an ornate border around it with a vignettes of a woman and jet, and the company's famous logo. This item has the printed signatures of the Company�s President, Arthur F. Kelly and is over 45 years old.